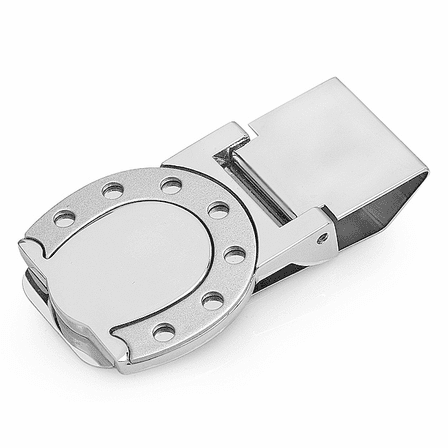 A horseshoe has long been a symbol of good fortune, and what better way to carry one than on your money clip! 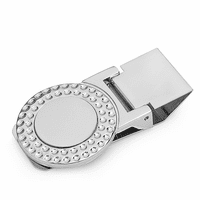 The highly-polished silver tone clip has a horseshoe inset with a satin-finish face in the middle for engraving a name or initials at no extra charge! 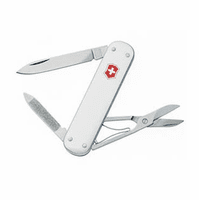 The hinged mechanism is powerful, and holds up to 20 folded bills, along with a credit card or two, then stores flat in your pocket! We will package the money clip in a gift box, and ship it out within one business day, so it's a perfect gift to send a little extra luck to friends and family! How do I add an engraving to the back of the clip? If you'd prefer engraving on the back, just let us know in the comments section of our checkout page what you would like engraved there. When you mean hinged, does it flip up for the money to be put in and then it flips down to close? Please explain. Yes, on the Horseshoe Hinged Money Clip, or any money clip that says hinged, it flips open so that you can put the money in, and then closes down on the money. I bought this item for the confirmation of my grandson. There was a personal joke, as he was using a paper clip for his bills. thought was very nice looking. 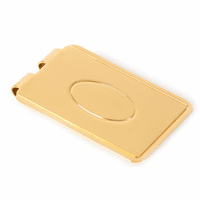 This item, ( money clip) was a quality and very nice. Good service and a great delivery time. I bought Hinged Horseshoe Money Clip for my sister. Her birthday is next month. Pros Holds the money nice and tight. What a great product; and experience in purchasing this item. I found the web site, and, even though I had never purchased anything from Executivegiftshoppe, decided to go ahead and order. Very, very, satisfied with product, prompt delivery, and product is EXACTLY what was represented on the web site. Will be purchasing additional items in the future. This was a gift for my husband & I had it engraved with his initial on the front and a special message on the back. It turned out just right. The back was just the right size for the message and the initial went in the middle of the horseshoe. Looks great.